This shop is located right in the city centre, just a few metres away from the Golden Roof. 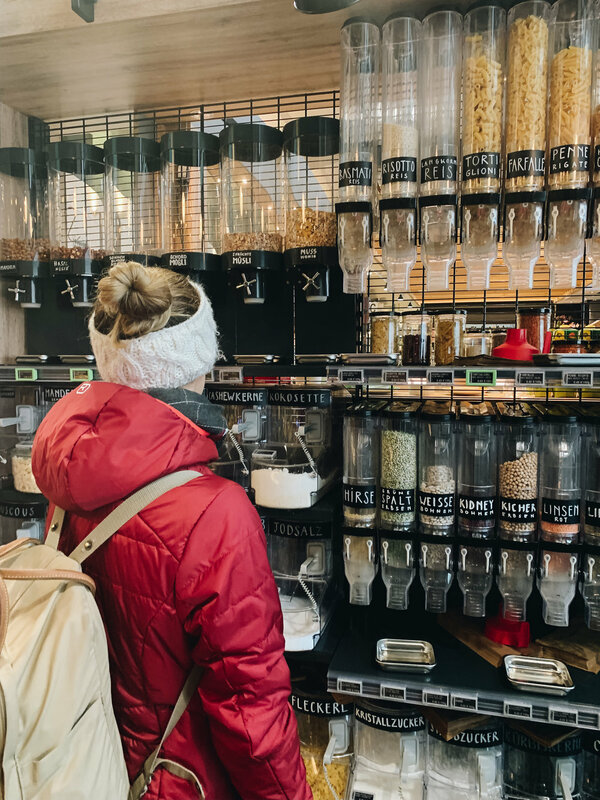 Shopping in Zero Waste shops is pretty simple. You either bring your own container or use paper bags you can find in the shop and put the goods you like to buy in there. At the cash desk, these containers (don’t forget to weigh them first as well so you don’t pay for the container itself) and the paper bags are weighed and, in the end, you only pay for the exact amount of product you got in that container. The shop is rather small but offers so much! 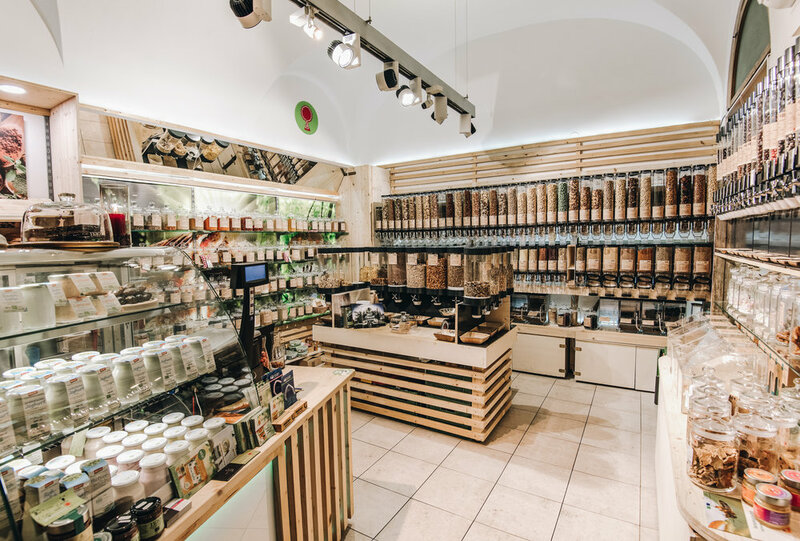 One of the biggest advantages of this shop is the vast range of spices that they offer! Also, here you can find almost every kind of food you could image, except for fresh produce. They also offer special mixtures of nuts, cereals and muesli – sometimes even ones you don’t find that easily in normal super markets! Just look at the pictures and tell us if your supermarkets offers that much variety! Another big plus is that here you cannot only buy food (of course including also drinks, organic coffee and some dairy products) but also other goods that might be useful when trying to cut down on waste, like bamboo toothbrushes, glass bottles, the 4OCEAN wristbands to support the clean-up of our seas and so much more. Definitely something you should take a look at! We also really like that fact that GREENROOT tells you exactly where every single product they sell is from and also informs you about the circumstances under which it was produced – something that might be quite hard to find out in regular supermarkets. All the pictures of GREENROOT you can see here we received from the shop itself and they were not made by us. This shop is not located in the middle of the city centre, but still only about 5 minutes from there, right in the Markthalle, where you can buy all kinds of great and delicious food, most of the time with less or no plastic, like fruits, vegetables and fish. The system works the same as in the shop mentioned first, you pay for just as much as you actually buy – and hopefully need. We are big fans of this system as we both live on our own, which means it can be quite tricky shopping for groceries for only one person and not waste any food due to large portions offered at regular supermarkets. By shopping here, we don’t have to buy a kg of a certain product and then eat it all day just to make sure it doesn’t go bad. The main difference to GREENROOT is that in this shop you can also buy meat and have a very vast variety of dairy products. While the variety of meat and dairy products is a bit broader than at the other shop, the variety of other foods, like nuts, cereals and so on, is a little smaller. But here, you can also buy more products like toilet paper and laundry detergents. As you can see, both shops offer slightly different things and complement each other quite well, so it’s great that they’re located so close to each other (not even 5 minutes by foot). Additionally, we want to introduce you to an app we’ve already mentioned on Instagram called “ReducePlastic”. The app is free (iOS, about Android we do not know but we guess it’s the same) and really easy to use. It was created to tell companies that you would like to buy their products, but they are wrapped in too much plastic or there are already some plastic free alternatives. You simply open the app, scan the barcode of the product – when using it for the first time you also have to enter your name and postal code – and click “send improving suggestion”. The app then collects these suggestions and as soon as there are 20 “complaints” for the same product, or after 4 weeks (whatever comes first), they send it to the companies. Definitely a great first way of showing companies that we, as customers, demand less plastic in the food industry. The app works best in Germany and also pretty well in Austria, we don’t know how well it works in other countries, but it’s a big step in the right direction, for sure.